I live in Sunnyvale and work in Foster City. That’s roughly 25 miles each direction on Highway 101 North in the morning, and 101 South in the evening. For the past several years, I’ve been carpooling with my coworker, so we could take advantage of the carpool lane and avoid a large portion of rush hour traffic. Our commute each direction is approximately 40 minutes. 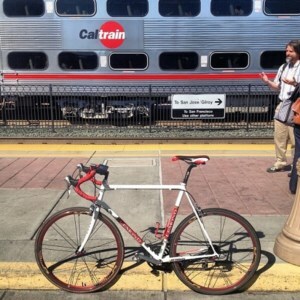 So why suddenly change from carpooling to bicycling via Caltrain? I have another coworker who is an avid bicycler and for the past couple of year, he’s been suggesting I try commuting by bicycle via Caltrain. The office covers $100 per month in the form of commuter checks. And I have easy access to a bicycle from a college friend who recently moved out of California. So my costs to “experiment” with bicycling was nothing out of pocket. Lastly, I started carpooling less because I utilizing the company gym twice a week, oddly enough on a upright stationary bike. So with the guidance of my coworker, we used Google Maps (to find optimal bicycling routes) and Caltrain’s website to determine the best train schedule and read bike rules. I found it was only a mile from my home to the most optimal Caltrain station and another three miles from the Caltrain station to my office. At about 10 minutes per mile (with all the traffic lights and stop signs), it takes me about 30 minutes each way. Stop at all stop signs and traffic lights, as if I were an automobile. If possible, stay away from parked cars in case they quickly pull out or the door opens. Signal to cars on my intentions to move left or right. Now, for some very Caltrain specific notes to remember (as of July 2013), I prefer the older-style trains (not the newer Bombardier trains). The old style trains hold 80 bikes vs the Bombarider which only holds 48, which could make a big difference. Find a conductor and ask for a Bike tag to specify your destinations, which is important for proper stacking of the bikes (some bicycles can get really rude if you stack incorrectly). And each train should have two bicycle cars (Northernmost train and a train the middle). Upon boarding, I try finding a seat where I have clear vision of my bike, but if not, its not a big deal. Forced daily exercise: I especially like this because it forces me to not be lazy and get some exercise. Because going to the gym isn’t really forced, it’s easy for me to stop going after a couple of weeks. Save money on gas: Instead of driving 7 days a week, I only drive 2 days a week. This saves me quite a bit on gas. Put less miles on a car: And because I drive less, I put less miles on my car. In the long run, my car will last more years. Spend time on Caltrain reading a book or watching podcasts: And the time on Caltrain is not wasted. I end up reading e-books, or watching a pre-downloaded video podcast. Don’t have to deal with rush hour traffic: Best of all, I don’t have to worry about that driver tailgating me (or about to cut me off) in traffic. This is much less stressful. Train delays: When there is an accident (train vs car or train vs trespasser), the entire line can be delayed. Checking with rider run twitter account can keep you updated. On top of that, Caltrain is not organized in setting up bus bridges. Crowded trains: Though I’ve never had to deal with it, it’s possible to get “bumped” (not allowed to board) if there isn’t enough space on the train for your bicycle. Sometimes after a SF Giants game, the train is overly crowded too. Longer commute time: You must take into account the train plus bicycling time, which will be longer. It takes a bit of advanced planning, but is not a big deal. Arguably more dangerous than driving: Many argue on this point, but my gut instinct is that bicycling is more dangerous that driving. And if it rains (and the road is more slippery, I always revert back to driving). But, this deserves its own post. Shower after biking: Depending on your profession, you may need to shower after bicycling. Less flexibility on when to leave: My schedule is tied directly with Caltrain’s schedule. During rush hours, train arrive every 30 minutes. Not a deal-breaker for me. Interact with sick passengers on Caltrain: A smaller issue is you interact with more people, some of whom may be sick and coughing or hacking a lung on the train ride home. After almost half a year, I’ve come to really enjoy bicycling. Since I don’t have kids, it was easy to adjust to a different schedule. I do strongly believe that once I have kids, I will be less inclined to ride my bicycle to work. But I’ll cross that bridge when I get there.